Originally published in the June 2009 edition of AP’s Audio.TST electronic newsletter. What kind of grounding is best to use between the various devices in my test system? The most effective grounding arrangement for multiple devices is “star grounding,” where each device in the system is connected to the measurement instrument ground via a separate grounding wire. We do not recommend bus grounding (daisy chaining), where several devices are serially connected to a low-impedance conductor called a “ground bus.” The resistance in each leg of the chain puts the devices at different ground potentials, and is not as effective as star grounding. When the serial links are very short, the combination star/bus grounding configuration can simplify connections while providing good grounding performance. The CAB-BOND kit, available from Audio Precision, provides the parts required for a star ground connection to one device, or a combination star/bus ground connection to two devices. For more devices, additional CAB-BOND kits may be ordered. Included are two ground cables, 20.5” (52 cm) and 4.25” (11 cm) in length, sized to connect one or two SWR-2755 switchers to an AP analyzer. Alternatively, you can make your own ground cables. These must be very low-impedance, heavy gauge copper wire, as short as possible for the application, and terminated with large surface area low-impedance spade lugs. If the lugs are a crimp type, make sure to use the proper crimping tool to ensure a secure, gas-tight connection. Fasten the one end of the lug to the switcher with a large, truss head screw. Attach the other end to one of the ground posts on the front of the analyzer. 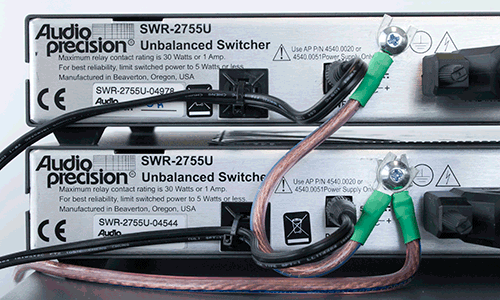 Our older SWR-2122 and SWR-122 switchers do not have a place for a grounding screw on the chassis. These units, however, are grounded through the power line, which is normally sufficient. If they are rack mounted, you can provide additional grounding through the rack. Make sure that the entire ground path is continuous by removing paint under the rack screws and rack ears as needed—the larger the contact surface, the better. If a good rack ground is not available, and additional grounding is needed, a hole may be added on the side of the switcher to add a grounding screw. Before doing this however, hold the loose end of a ground cable against the chassis and measure the noise. Sometimes having multiple grounds can cause ground loops that make noise worse instead of better. This entry was posted in Technical Library, Tips & Tricks and tagged grounding by Eric. Bookmark the permalink.